Henri III and his Court | Digitalestate Inc. Please enjoy “Henri III and its court” in preview. Act III; Duke of Guise forces Duchess to write a letter. 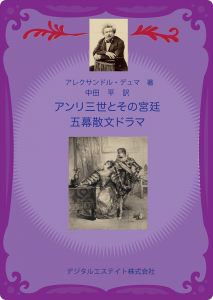 In general, research on French romanticism in Japan is tenuous, but research on Alexandre Dumas is almost non-existent. Speaking of Dumas, the impression of his works as popular entertainment are strong such as Three Musketeers and The Count of Monte Cristo, and are also notorious for reasons that he used a number of “subcontractors.” Moreover it could be a bad thing to do it because it was so to speak as a so-called poor enough not to know the exact total number of the whole work. How exactly did he publish his works? The catalog raisonné of the Works of Alexandre Dumas published by Calmann-Lévy in 1902 is following. (6) Theaters: 66 pieces, 25 flights. The Society of Friends of Alexandre Dumas website lists 325 works. Moreover, according to the site of the amateurs of Dumas, it counts 688 works by mixing everything. It is the first authentic drama in five acts in prose, the ideal achievement of Stendhal, the monument of the first victory of the romantic theater one year before Victor Hugo’s “Hernani”. On July 20, 1578, Catherine de Medici who came from Florence to marry the late King Henry of France and became the mother of King Henry III and the astrologist Ruggieri, using the fact that St. Megrin, Henri lll’s favorite is desperately in love with Duchess of Guise, plots to rid the influence of the weak king by Saint Megrin and Duke of Guise Duke at the same time. In the midst of the wars of religion, the murder between the Catholic and the Huguenot, it is the time called the battle of tree Henry: Henry III, Henry of Guise and Henry of Navarre who will become Henry IV of France. Ruggieri meets Saint-Megrin and Duchesse de Guise asleep by the anesthetic to convince them to love each other. At the hasty request of Henry of Guise, who wished to call himself the head of the Catholic alliance to fight against the Protestants by concealing the secret intention to be the next king of France, Henry III convinced him to wait until the States General. Duc de Guise refutes that the situation is imminent. To the Duke of Guise appeared at the courtyard in armor, which boasts: “When the bullets arrive in front of me, monsieur le comte, this is proof that I do not turn my head to avoid them. Saint-Megrin hit him a dragee by the blowpipe. The duel between the two burning anger is determined. 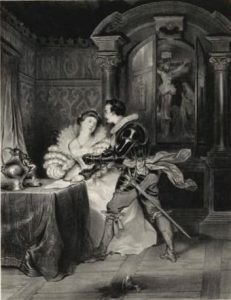 Henri de Guise, seized with anger, clasps his wife’s arms to make a blue by the iron gauntlet and strength to write the false letter that lures Saint-Megrin to the Chamber of the Hotel de Guise. On the other hand, the tribunal entered into the resolution for the appointment of the head of the Catholic Alliance, Henry III. Was declared: “We, Henry of Valois, by the grace of God, King of France and Poland, By the present deed, drawn up by our beloved cousin Henry of Lorraine, Duke of Guise, the association known by the name of the Holy Union… And from our authority we declare ourselves the head of it. He became the chief himself. Duc de Guise tries to say something to Catherine de Medicis, but Henri forces him to make the signature. The first plot failed, the closing of the conference is declared in front of Guise who signed in spite of himself. The French theater was a melting pot of excitement. Duke of Orleans who had attended him heard sanctified as a poet one of the employees whose name he did not even know. Alexandre Dumas profoundly engraves his own name on the history of French theater. 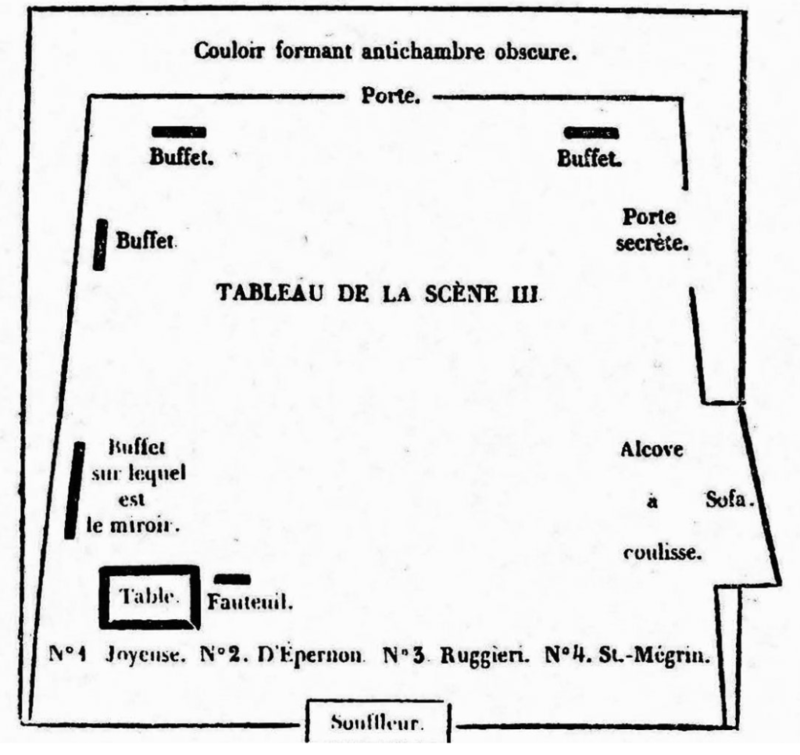 The board staged on the first act in 1829 at the French Theater. If you want to read the original book, you can download Google Play Books.